Waterproof compact cameras, and single use camera have built-in strobes, as do the Sea & Sea Explora and Motormarine cameras. The Explora has a dedicated strobe, which is attached to the camera, too close in my opinion, and the Ikelite Aquashot has a strobe option that is mounted on a conventional arm. With the exception of the Aquashot, these strobes will tend to maximise backscatter, to the extent that you will see a cloud of particles in what you thought was a clear sea. 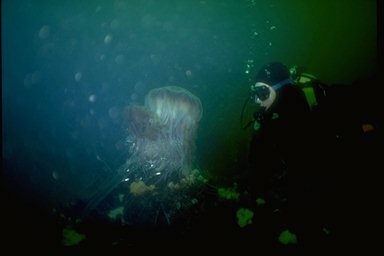 I was once forced to use the on-camera strobe on my Motormarine during an expedition in Scotland when my main strobe failed, and was horrified by the results. A study of a jellyfish turned out as a study of the particles in the water!. While the Sea & Sea Motormarine and SX1000 cameras use their own brands of sync leads and strobe electronics, everything else available is fully compatible with the Nikonos V, and consequently with Nikon cameras in housings. I have no experience with other manufacturers cameras in housings, and therefore do not know how compatible these strobes are to Canon, Pentax and Minolta cameras. Dedicated land strobes, e.g. the Nikon SB-25 will additionally need an underwater housing. There are however inherent advantages to using the SB25 with a housed Nikon camera, as this is the strobe designed to work with the camera, and is capable of giving exceptional results, especially in the area of balanced flash. There is no reason to use these on any other setting than TTL, although reports have been received that some photographers prefer the results obtained from the F801s/SB-24 combination when dialling in a two-thirds stop underexposure on the strobe. Figure 17. A selection of underwater strobes. Note that Guide numbers refer to water, in metres, using ISO 100 film. While one would expect prices to be proportional to coverage and guide number, this does not hold true between manufacturers, and you are advised to compare these and other features closely against price. The coverage angle, and whether it can cover your widest lens, with or without a diffuser. The recharging time if the strobe is powered by internal nicad batteries. Whatever power source you use, if you have not used your strobe for some time, then the capacitor's ability to receive and release a charge may have diminished, and it will need 'exercising' before you put it to use. This conditioning is termed "Forming". It is best to follow the instructions in your strobe manual, as there are a number of recommended ways to go about this, varying from leaving the strobe on for an hour or so with new batteries, to repeatedly flashing every 30 seconds or so for 10 to 20 flashes. Most strobes will be capable of using some form of rechargeable batteries, and some will be exclusively powered by them. Keep all battery contacts clean and free from corrosion. Install a new set when you change films. While this may not be necessary, you will always have a fully charged set to use. Always discharge batteries before recharging them to prevent memory effects. I put mine in an old torch and let them run down until the torch starts getting dim, but don't fully discharge or overcharge nicads, or you'll shorten their life. Nicads discharge quickly under cold conditions, while alkaline batteries last longer and are therefore a better choice for such conditions. Recently a series of AA size Lithium batteries has come on the market. Camera manufacturers such as Nikon specifically advise you not to use these in their equipment, as voltage spikes which occur when turning the equipment on are high enough to severely damage some of the cameras electronics. Always use alkaline batteries in cameras as you get longer notice of them starting to reduce in power. You may have read in other photographic books how Guide Numbers are an indication of a strobe's power, taking into account the actual light output, how big an angle of coverage this is spread over, and the sensitivity of the film being used. You may also have read on to discover how guide numbers can be used to calculate an appropriate aperture based on the distance of your subject. Unfortunately, underwater much of this does not apply. Land guide numbers are concerned with incident illumination of the subject, assuming that, being in air, there is negligible absorption of the light as it passes through the medium. This is far from true underwater, where we suffer from light and colour absorption for every centimetre of water the light has to travel through, and a not inconsiderable amount of scatter from the various particles in the water. Guide numbers realistically offer little guide underwater, and what are much more useful are the various charts provided with the strobe matching subject distance, aperture and film speed. If we use a Sea & Sea YS-50, with a guide number of 24, and have a subject at 3 metres away, then by using the accepted formula, we arrive at an aperture of 24/3 = f/8. The guidance chart on the strobe itself tells us however that this distance is at the limits of the strobe's ability at f/3.5. While we could arrive at some 'fiddle-factor' that converted land guide numbers to underwater guide numbers, it is much better to rely on documented advice about the range of a particular strobe, and use the underwater exposure table provided by the manufacturer, and the one for the YS50TTL is reproduced below, as an example. Figure 18. Sea & Sea YS50TTL distance table. While the table shows no distances less than 0.3m, for macro work we will usually be using some form of extension, and consequently will require a greater amount of light. All these strobes work perfectly well with macro subjects of average reflectance. Some of you may be thinking, that as you only intend to take TTL strobe photographs, there is no need for you to consider guide numbers as the camera will do it all for you. This is true to a degree, but you must be aware of the limitations of the strobe that you are using. The Sea & Sea above gives a range of distances which are recommended for a given aperture, and this applies equally to TTL strobe photography as manual. There is a minimum and maximum power of flash that the strobe can produce, which equates to about 5 stops difference in exposure. If your subject is too far away, then all the strobe can do is give its maximum power which will not be enough to correctly expose the subject. If however you are too close, then the strobe's minimum power may well be enough to seriously overexpose your subject. . While the 60mm and 105mm Nikon macro lenses give equivalent performance, remember that with the 105mm lens you are shooting from almost twice as far away, and will therefore need four times the strobe power to illuminate a subject. The extra distance offered by the 105mm has many advantages, especially in the flexibility of strobe angles, but brings with it other complications if your strobe isn't up to it, and must be moved closer. Be aware of the limitations of TTL photography, and remember that the TTL meter in the camera is just like any other, and is expecting a subject of average reflectance. If you are photographing a fish with shiny silver scales, then it is quite likely that you will end up with some overexposed highlights. The TTL sensor, in addition, can only do its best to read the light coming through the lens, and if you have the camera pointing up at the sun, then this is likely to confuse it, and result in an underexposure of your foreground subject, however good your balanced flash is! Dual strobe photography is possible in a bewildering variety of means, taking two strobes in TTL, manual or slave in almost any combination (you can't have two slaves on their own for obvious reasons!). Dual strobe light can enhance a picture by filling in shadow areas that would otherwise detract from it, but it is important to balance the light, with one source clearly being the main illumination, and the other merely filling in the details at a lower power. Two strobes with overlapping areas of illumination can effectively fill a wide angle shot when neither of the individual strobes has the coverage angle to cope with it. Be warned about the reliability of slave triggers, many are built into the front of the strobe housing and will naturally be pointing at the subject rather than the strobe that they are meant to slave from. Alternatives are available, and one particularly compact solution is a slave trigger that attaches to the end of a conventional sync cord where it would normally attach to the camera. This gives you much more control over where the slave sensor is pointing, and increases the chances of it firing correctly. Do not assume that any particular pair of strobes will deliver light of the same colour temperature, and be aware that if they don't, the results may look very strange. You may think to yourself that all electronic strobes deliver light at about 5,500K, and you would probably by right, but if one strobe is significantly further from the subject than the other, then the absorption effects of the water may well change the balance between their temperatures. This may not necessarily be a problem, but if your slave is not TLL, make sure that is delivers less light than the main strobe, and does not overpower it. Other than traditional slaves, how do you set up a dual lighting system? One newly released option is the Ikelite TTL slave facility. This is a special sensor, dedicated (naturally) to Ikelite strobes that will switch itself on when the main strobe fires, and switch itself off when the main light quenches. This seems to be the ideal solution, matching the TTL philosophy with a switching slave taking its cues from the main light. However this may not necessarily be the ideal choice when you review the newer options from Nikon, including the SB-26's "delay" mode for its wireless slave flash, which is claimed not to affect the TTL operation of the main strobe. This naturally raises questions in my mind about the precision of the Ikelite arrangement, but its increasing popularity in land photography indicates that it may well be a useful accessory for a lower powered secondary strobe. I have recently purchased a Sea and Sea YS30, which can act as a TTL slave, but I realistically haven't used it enough to give you a proper assessment. The ideal solution for the housed Nikon system must naturally be a matched pair of housed Nikon strobes, and while two SB-24/25/26/28 units would be perfect, any compatible Nikon strobe would be adequate. The wiring required for dual strobe is still projected as a bit of a black art, even though multiple Nikonos TTL cables are available (neither however could be classed as cheap!). Your housing supplier should be able to correctly wire up two strobe connectors to your housing, but if you have a Nikonos V or Sea and Sea, then you really are restricted to the expensive cables they provide.